Day Sart Chinese or festival Sart China. (Sart Chin Day or Ghost Festival or Spirit Festival) will meet with the full moon 15 months 7. based calendar Lunar Chinese calendar Lunar Chinese are generally slower than the calendar year Lunar Thailand about 2 month flip calendar with lunar system of Thailand and China are seen as the full moon of the 15th lunar month of the Chinese Lunar 7th Thailand to become the ninth day of the 14th lunar month. 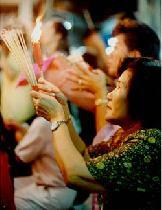 China is a prime festival season the descendants of the Chinese to express their gratitude to their ancestors. By ceremonial offerings. And also the month that the gates of hell open and the spirits came to charity. Zhongguo nongli qiyue shiwuri shi Zhongyuan Jie. Lee Chong Chee Yee Kwok in the mosques submarines Shijiazhuang Shijiazhuang to Wuhan terminal shall Jian Ye mosques of Antioquia. 15 months seventh lunar Chinese lunar calendar. Was. festival favorite V Ye be allowed. Festival. Zhongyuan. 's China. Or as we call that day Sart China is the day that every family ritual offerings to deceased ancestors, so sometimes it is called the day such as the Chinese. Guijie. Guilin Jia. , or. Wangren Jie Huang Jia He poured. Gui = ghost , which is called the deceased. GuiJie or Wangren Jie festival offerings so that we, who passed away. The Chinese believed that the twelfth lunar month, 7 to 15 days, in which the souls of those who passed away. Will return to earth to visit their families, so today to celebrate the Chinese ancestral offerings every household.